It’s time once again when I need to pack my stuff for a photo assignment. Normally, when I pack my stuff for a personal travel, I try to be as light as possible and leave some things that I would probably not use. But when packing for a photo assignment, its different. I had to bring other stuff along that I may probably need. 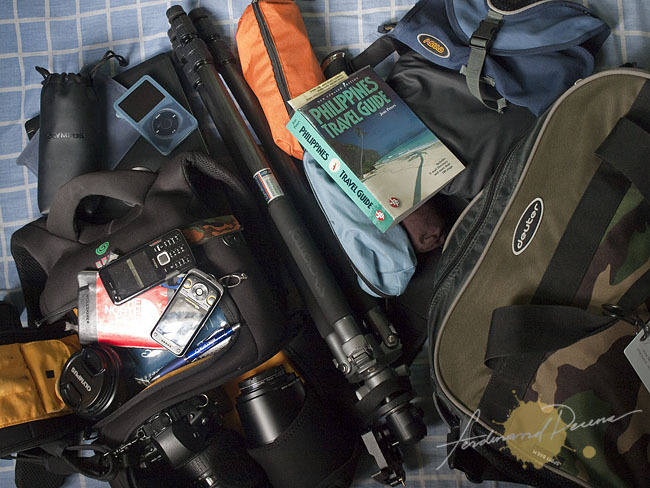 Here’s just an insight on what I bring along during a photo assignment trip. Digital Cameras, especially DSLRs is one piece of expensive equipment we tend to carry around more often. It would be a nightmare if I loose my camera when some street thieves would slash through my strap and run off with my camera on a motorbike or loose my camera from fall from weak strap connectors. I know the chances are slim but I actually know people who experienced this horror stories so I’m a bit paranoid with my gears. I also don’t like using my default camera strap since I don’t like the brand name screaming (not that I didn’t love the brand) on it and I just didn’t find them comfortable in the long run especially if you have a heavy camera. 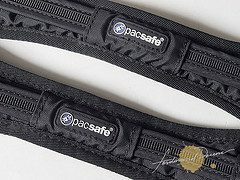 It’s a good thing there are third party camera straps available from manufacturers like Crumpler, Kata and Tamrac, OP/Tech but my favorite among them is PacSafe’s CarrySafe 100 strap.